Ashok Leyland is a leading manufacturer of trucks in India, especially as far as medium duty and heavy duty trucks are concerned. Though the Ashok Leyland trucks are famous in M&HCV segment, the company has lately entered into ICV trucks and LCV trucks segment as well. Powered by H-Series engine, the M&HCV range of Ashok Leyland trucks are respected for their class leading mileage and lower maintenance. In BSIV era also, while majority of commercial vehicle manufacturers in India have shifted to SCR technology to meet emission norms, Ashok Leyland trucks are powered by iEGR technology which does not require any additional consumption of ad-blue. This way, in BSIV era again, Ashok Leyland trucks have carved a niche for themselves. The prominent Ashok Leyland trucks in this haulage category are Ashok Leyland 1618, Ashok Leyland 2518, Ashok Leyland 3118 and Ashok Leyland 3718. Ashok Leyland 4923 & Ashok Leyland 4019 are the hot selling models in tractor trailer category. The company has created 2 umbrella brands in the M&HCV trucks segment namely – Ashok Leyland U trucks and the Ashok Leyland Captain series. Both these ranges are available at all major GVW nodes and differ in terms of cabin design, structure, aesthetics & engine. 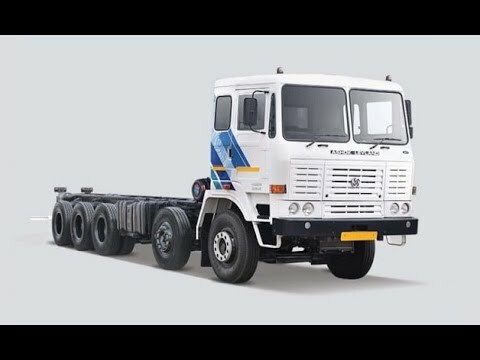 Ashok Leyland 4123 is again a brand new 41 ton GVW truck with 10x2 axle configuration and 16 wheels, soon to arrive in the Indian trucks market. While the company entered into ICV & LCV trucks segment quite a few years ago, Ashok Leyland has come up with a complete range of vehicles under different umbrella brands like Ecomet range, Boss Series and the Ashok Leyland Guru. The prominent models under Boss range are Ashok Leyland Boss 913, Ashok Leyland Boss 1113, Ashok Leyland Boss 1213 and the recently introduced Ashok Leyland Boss 1413. Similarly, the older Ecomet range consists of models like Ashok Leyland Ecomet 1012, Ashok Leyland Ecomet 1212 and the latest being Ashok Leyland Ecomet 1214 with higher GVW and payload than competition. Ashok Leyland Guru 1111 is a one of a kind truck with a 3 cylinder engine which helps in offering best in class mileage in this segment. In the LCV segment, company has expanded its portfolio under Partner brand name. Ashok Leyland Partner truck comes in different configurations of 4 wheels and 6 wheels with different GVW points. These Ashok Leyland trucks are manufactured at the state of the art plants located in Chennai, Pantnagar and Hosur.